One of the big items on my to-do list before we put our whole lives into storage was to take a serious look at my yarn stash and start packaging up yarn, needles and patterns into projects so that I would have lots to keep me busy during the months we wait for our renovations to finish. It was a great exercise for me because I have this little problem with my stash: it’s full of one or two skeins of this or that yarn (lovely, gorgeous, artisan yarn) that I bought while on holiday. Problem? What problem, you say? Well it makes it very difficult to find just the right amount of yarn for any given project when all you’ve got is a skein or two and you need more. And rarely do I have multiple colourways in a single brand of yarn that could be combined for a project. As a result I’ve been trying to work down the stash and change my buying habits, putting myself on a yarn diet. I now have a good 10-15 projects packaged up and ready to go at a whim. I still have tons of yarn in storage to deal with at some point, but these projects put a good dent into my yarn problem. Now I just have to knit, knit, knit! 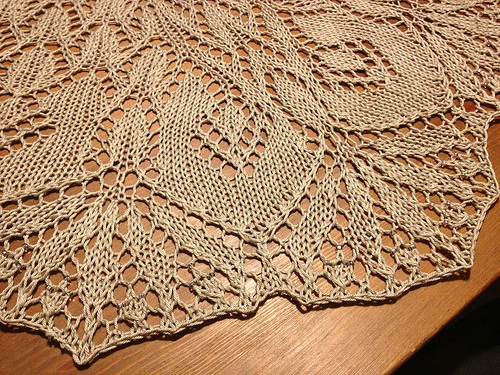 I’ve been on a bit of a lace kick this year, and so far have finished two nice-sized shawls. I used the same yarn for both, something that’s been in my stash for a long time, some Patons Grace mercerized cotton that I got a ton of at one of the big outlet summer sales a number of years ago. I think these colourways (Champagne and Apricot) are discontinued now, but the yarn was surprisingly lovely for making summery shawls that can still keep you warm on a cool night. 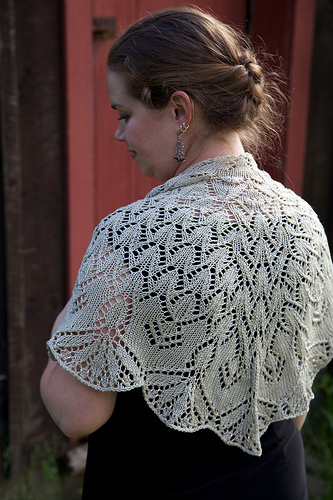 The drape is spectacular, and the yarn really shows off the stitch patterns. 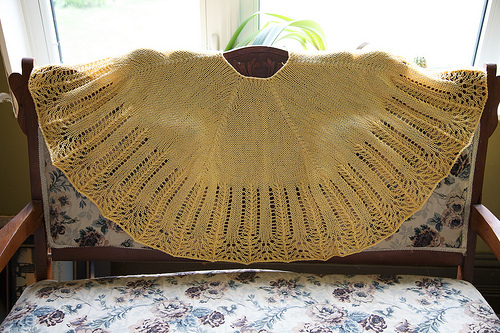 I knitted the Golden Orchids pattern by Aino Kaikala to wear at a couple of weddings we had on the same day, across the street from each other. This was probably the most challenging lace I’ve ever knitted, not because the stitches were hard but because the patterns were complex to follow. Once I had the hang of it, it went very well. I also learned the sanity-saving technique of using lifelines, after several frogging sessions. 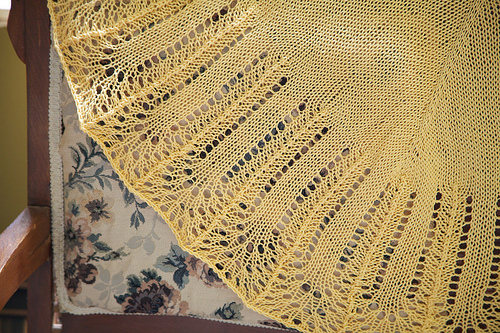 This shawl includes a few rows of beads to bling it up a notch. 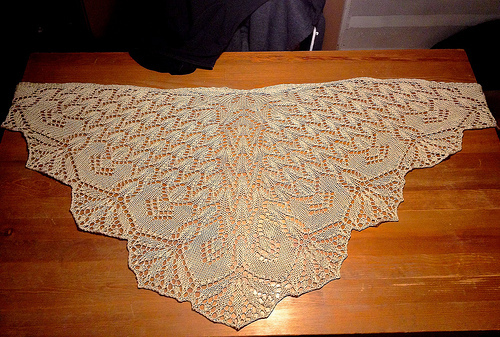 I also made the Weekend Shawl by Anne Kuo Lukito for my mom for Mother’s Day. This was a super easy, fast knit, and I finished it in less than a week. I’m very happy with how it turned out. I’m now started on Song of the Sea by Louise Zass-Bangham a long cowl that can be worn as is or doubled up as a cozy cowl. This might be destined to be a Christmas gift. The yarn is Knit Picks Imagination Hand Painted Sock Yarn in the “Frog Prince” colourway. This yarn is a soft, lovely blend of merino wool, alpaca and nylon, and the colours are gorgeous. Pictures to come!